Saraveza will be hosting a peach beer festival, Peche Fest, with some heavy hitters in the brewing industry presenting their version of a peach beer. The samples for this event is a little different than most fests. A glass must be purchased for $10 which comes with 2 drink tickets. Each ticket is good for a 5 oz. pour, with further tickets costing $2. The event will take place in The Bad Habit Room at Saraveza located at 1004 N. Killingsworth St in Portland. More details can be found below. $10 for a Glass and 2 drink tickets good for 5oz pours. Additional tickets $2. 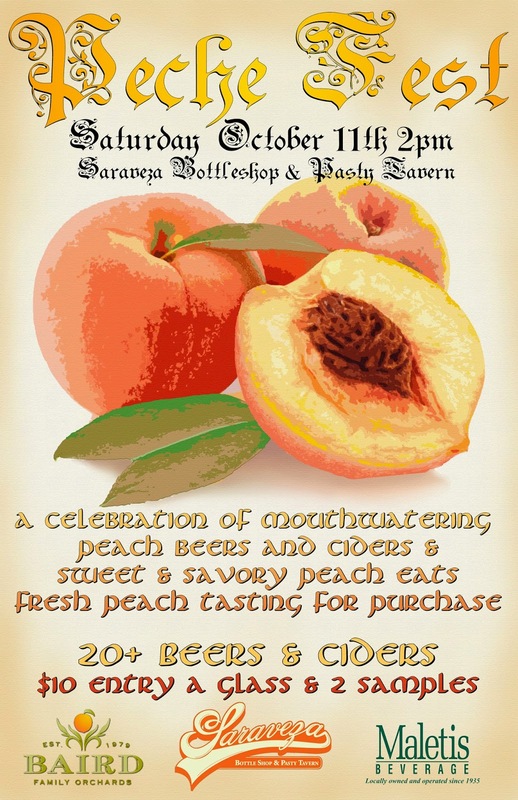 A dizzying array of fresh and vintage Peach beer and cider will be featured along sweet and savory peach food dishes and fresh peach tasting and sales from Baird Family Orchards at the 2nd annual Peche Fest on October 11th at Saraveza and The Bad Habit Room. Featuring a high proportion of barrel-aged and sour beers, vintage Peach lambics, refreshing Berliner-Weisse's and ciders and new offerings made exclusively for the fest. Expect 20+ rare Peach beers and ciders on tap in addition to the special food menu and chance to purchase mouthwatering peaches for home.